New Year – New Games! Here’s what’s coming in the first month of 2018. AT LAST! After tens of thousands of search hits on our website over the last 10 months, the wait is finally over! Gloomhaven hits retail on January 15th! The epic co-operative dungeon crawl and town development experience (95 scenarios! 17 character classes! Hundreds of hours of gameplay!) A reasonable price point that doesn’t involve hundreds and hundreds of dollars! Gloomhaven is now available for Pre-Order! Dice Throne is a board game of tactical card play, powerful heroes, and unique abilities. Choose from a variety of distinct heroes from the moon elf to the barbarian, activate abilities, buy new cards, and manipulate your dice to defeat your opponents and claim the Dice Throne! With an ever-expanding roster of heroes to choose from, buy Dice Throne for a fast paced 2-6 player combat game playable as head to head, free for all, or in teams. Dice Throne is Available Now! Seek out new lands to settle and control; lead your crew on raids, construct outposts, and ready the longships; it’s time to be Explorers of the North Sea! With your crew and a longboat, lay new tiles to venture to new islands, load livestock, raid settlements, and play cards to make the most of your limited time and be named the greatest Viking captain. Buy Explorers of the North Sea for a board game of new horizons to explore. Build a beautiful garden with the best possible view in Topiary, a game of positioning and placement! In this board game, players try to position their visitors on the outer edge of a beautiful topiary garden in order to give them the best view possible; which means you need to arrange your topiaries carefully by height, as large ones will block small! Buy Topiary for a quick, simple game of beautiful sights and strategic placement! In the world of The Walking Dead, there is No Sanctuary. A co-operative board game of desperate survival based on the hit TV series, No Sanctuary is designed by Adam and Brady Sadler (Warhammer Quest: The Adventure Card Game). Work together against desperate odds, fight off waves of the dead, stand toe-to-toe with the living, and keep competing interests within the group satisfied. Buy The Walking Dead: No Sanctuary for a game of leadership, morale, and different playstyles for each survivor. The Android Universe heads to Africa with its cyberpunk vision of a future Uganda. The second space elevator is being constructed on Lake Victoria, and with it a new future for the entire human race. 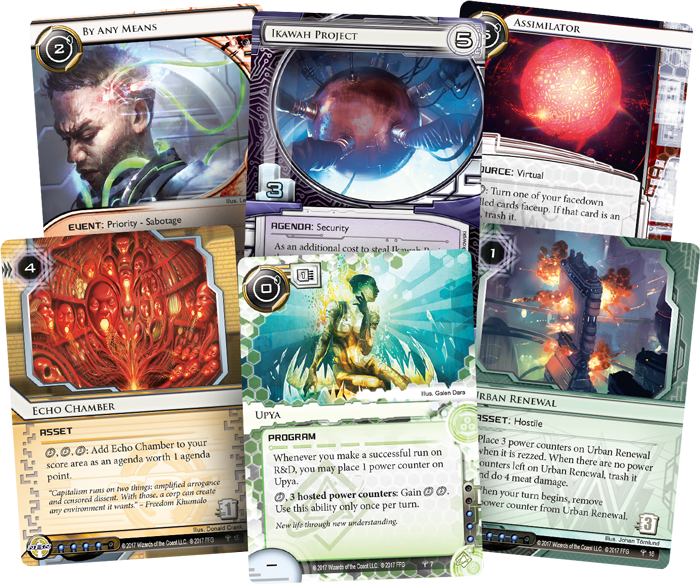 Sovereign Sight is the first Data Pack in the Kitara Cycle for Android: Netrunner, introducing new powers for corps and runners alike; new paradigms and new cultural shifts as cyberpunk moves to a different continent. Buy Sovereign Sight to begin your journey into the Kitara Cycle. Vampiric clans in open conflict as aimed indiscretions, savage attacks, and a web of lies come between the brutal, animalistic warriors of the Clan of the Beast and the graceful, deadly members of the Clan of the Rose – or the human inquisition caught in between. Blood Bound is a social deduction board game where clan members must protect their Elder, hidden amongst themselves, and must attack, negotiate or deduce the identity of the other players at the table. Each player has an ability unique to their character, and this ability can be used only at the moment that he reveals their rank; from the lethal Assassin to the stalwart Guardian. Buy Blood Bound for a game of traps and plots, deadly deception and and knives in the dark. Finally back in print! Container, the classic game of big ships and big production, returns in a 10th Anniversary Jumbo Edition! Now with huge ships and realistic containers to load and unload, building (or destroying) your living economy has never been more fun! Build factories & warehouses, ship goods, wield subsidies and maximize profits! But watch out for your cash reserves because the player-driven market can go sour at any time, and you’ll need to be ready to change your strategy. Buy the Container 10th Anniversary edition for a new edition with wonderful new resin ships, and a new Investment Bank expansion module! A tremor of fear ripples through the streets of Hong Kong. Word is out that a recent string of murders may have been committed by one of the very investigators charged with solving them. The police are bringing in more help. Behind the scenes, the killer is recruiting too. Deception: Undercover Allies is an expansion to Murder in Hong Kong that adds new roles to both teams. More means of murder, more clue cards, and fresh scene tiles bring life to the forensic scientist’s gameplay, and new events challenge the already tenuous trust which exists among the investigators. Buy Deception: Undercover Allies for a whole new level of deception in the battle of wits between murderer and investigators. Winner of the 1994 Spiel des Jahres, Manhattan is a game of building skyscrapers designed by Andreas Seyfarth of Puerto Rico and Thurn & Taxis fame. Lovingly illustrated by Jacqui Davis of Viticulture and Ex Libris fame, Manhattan allows you to raise your own tower or merge with an opponent’s in a hostile takeover while defending your own towers from mergers.